Shane Quigley’s practice focuses on business law, specializing in counseling and assisting small- and mid-sized businesses through every phase of existence. He has extensive experience in starting businesses in many sectors and in handling issues ranging from partnership and shareholder disputes, investment negotiation, contract claims, fraud, and employment issues. He also has experience in establishing wills, trusts, estate plans, and businesses succession plans. He has previously handled a variety of business litigation matters for both private and non-profit entities, including dissolution actions, breach of contract matters, and civil restraining orders. 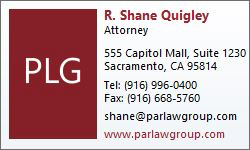 Shane is admitted to practice law in all California state courts and the United States District Court for the Eastern District of California. Shane obtained his Juris Doctor from University of the Pacific, McGeorge School of Law, graduating with distinction. During his time at McGeorge, Shane served as Primary Legislative Editor and Primary Managing Editor of the McGeorge Law Review, while also being an active member of the Criminal Law Society. Prior to law school Shane graduated from California State University, Long Beach with a Bachelor of Science in investment finance, where he served as Pi Kappa Phi’s Treasurer. © 2019 Parker Law Group Attorneys, A Professional Corporation, All Rights Reserved.